This is the first of two posts discussing the benefits of ORCID to researchers, and the implications for libraries and research services. Before starting my 5 min lightning talk at the recent LIR Seminar in March I asked the question “How many people here have heard about ORCID?” I was somewhat surprised that very few hands came up. Maybe it was the late hour – the last presentation of the day and we were running late – and people were anxious to get to their buses and trains. But still, I certainly had expected that ORCID would be a rather familiar term for librarians by now. So, that’s one reason to write a guest post and to provide a few facts about ORCID! ORCID (Open Researcher and Contributor ID) is a persistent, unique identifier for researchers and scholars. Someone once dubbed it “a DOI for researchers”. As a non-profit, community-driven, open organisation, ORCID.org provides an identifier registry for researchers from all over the world and from all disciplines. By registering for an ORCID ID (which takes less than a minute) researchers obtain a 16-digit number that is unique and stays with them throughout their whole career. No matter if they change institutions or even change their names – the ORCID ID stays the same. Why should they do this? Well, we all know how difficult it is to search for publications by authors with a common name. How many J Smith, D Zhang or M Murphy do we have in Web of Science or JSTOR? Or how is the German name P Müller recorded in PubMed (P Müller, P Mueller or P Muller)? ORCID is a perfect tool to help solve the problem of name ambiguities. There are other name identifiers trying to do similar, such as Thomson Reuters’ ResearcherID or Elsevier’s Scopus ID. But they are restricted to their respective environments. ORCID is independent from publishers, organisations or institutions and therefore well positioned to become the one identifier that can be used everywhere. More than 130 organisations have implemented ORCID IDs into their identifier systems to date – publishers (e.g. Wiley, Nature, Taylor & Francis), scholarly associations (e.g. American Physical Society, IEEE, Royal Chemistry Society), funding agencies (e.g. NIH, Wellcome Trust), universities (e.g. Boston Univ., Texas A&M, Univ. Hong Kong), repositories and profile systems (e.g. CrossRef, Dryad, ImpactStory, Thomson Reuters). And the number is growing. By implementing ORCID across multiple research-related systems, the exchange of information between different systems is much more efficient: there is less time needing re-entering data, improved data quality, and easier maintenance. The ORCID registry is a central hub for a researcher’s activities. It can connect his/her affiliations (university, academic association) with his/her data in funding agencies systems, with publishers’ records and even with non-publication research outputs such as datasets, posters, patents or performances. About 650,000 researchers worldwide have obtained an ORCID ID so far, an impressive number for a service that started only in October 2012. But sooner or later almost all researchers will be confronted with a field that requires an ORCID ID, be it at manuscript submission, at funding application or when registering with a scholarly association. What does a researcher have to do to register? 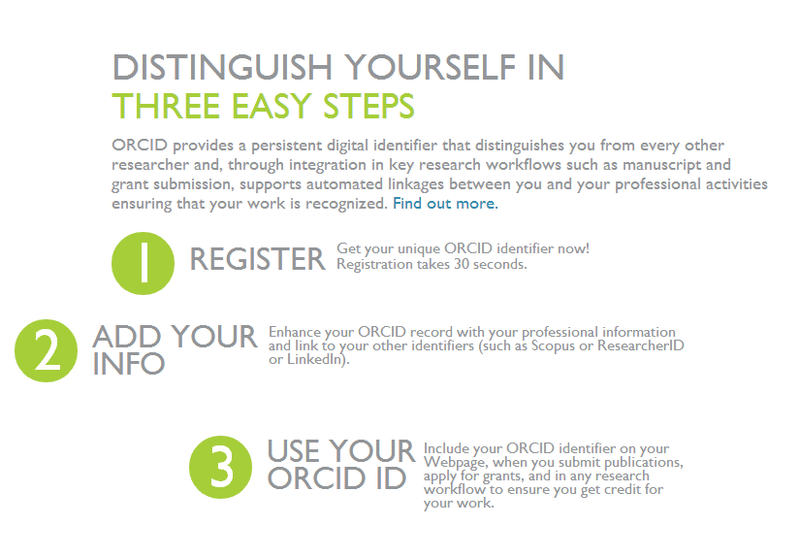 Firstly, go to the ORCID website and register by filling in some basic information (name, email address). Next add personal data, such as affiliations, education, and any links to other services or networks. And finally, you can add data about your publications and other research output. Many publications can be easily imported by using “wizards” that connect directly with CrossRef or ResearcherID; any missing publications or non-publication outputs can be added manually (choose from 37 types in 4 categories). It should be highlighted that although ORCID may initially look like a profile system such as ResearchGate or LinkedIn, it is something different. ORCID is now becoming a standard that is endorsed and implemented by major publishers, research organisations and institutions. As librarians we are often one of the first ports of call when it comes to new developments related to scholarly communications and research outputs. If asked about such developments by our users, we should be able to provide an informed answer. Libraries can also play an important role in actively promoting these kinds of services which can potentially benefit our users. In part 2 next week, Michael will discuss his role as an ORCID "ambassador", including outreach, advocacy and promotional activities.